This is the first post in a series on The Power of Measurement. In this economic climate, these posts are designed to cover ways to make your website as successful as possible. Over the course of the next few weeks, our in-house Analytics guru, Avinash Kaushik, and others will demystify the world of website analytics and offer tips for getting the most out of your metrics. -Ed. Would you believe me if I said you don't need a Ph.D. to understand your website data? No? Believe it. Free tools like Google Analytics can help simplify website data so that you can better understand what visitors are doing when they arrive on your site. One of the coolest innovations in understanding your website has been to provide delightful metrics on your web data so that you can make direct changes to your site. In lesson one of our series on The Power of Measurement, we will learn about bounce rate and how understanding it can improve your website. You may be used to reading about how many "hits" a site or a page has received. But reporting a "hit" meant something back in 1985 when it was essentially a pageview (the number of times your webpage was viewed). Today, you will find that each web page gets many "hits," rendering the metric meaningless. While the number of "hits" a page received used to be the best measure of success, we now have more in-depth and detailed metrics to analyze the performance of our web pages. Bounce rate is insightful because from the perspective of a website visitor, it measures this phenomenon: "I came; I puked; I left." (OK, technically it also means the number of sessions with just one pageview.) While metrics like visitors show the number of people who came to your site, bounce rate will tell you how many of those people were unimpressed and left your site without taking any action (not even dignifying the site with a single click!). 1) It is really hard to misunderstand. It measures the number of people who landed on your site and refused to give you even one single click! 2) It is available in most web analytics tools, including our own Google Analytics. 3) It is quick and easy to use. 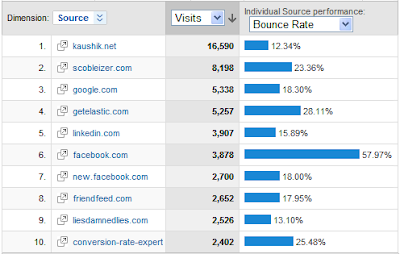 Bounce rate will help you understand where and how to make changes on your website in under an hour. Tip #1: Find out where your visitors are coming from and which of these sites sends visitors with the highest bounce rate. To do so, all you have to do is go to "Traffic Sources" (in Google Analytics, or whatever tool you are using), click on "Referring Sites," and boom! In about fifteen seconds you know which sites are your "best friends forever" (BFFs), and where you need to look a tad deeper. By identifying the sites that are sending you visitors with high bounce rates, you can investigate the reasons why (the campaigns, the context in which your link is placed, the ads) and make changes to ensure that visitors find what they are looking for when they come to your site. 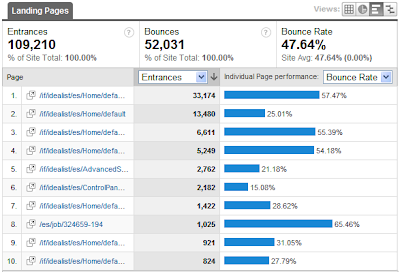 You can see different pages of your website on the left and the corresponding bounce rates on the right. Remember, you don't decide the homepage of your website. When people search, the engine finds the most relevant page on your site and that's the homepage. If you have 50,000 pages on your website, you have 50,000 homepages. The report above is showing the top ten pages of your website and which ones might be letting you down by not engaging your visitors enough to get even one click! In under an hour you can discover which sources are your BFFs and which pages on your site need some sprucing up. This will ensure lower bounce rates, higher engagement with your site, and perhaps even higher revenue. To learn about other ways in which you can use bounce rate effectively, check out this article on my web analytics blog, Occam's Razor.